When Will The Questions Stop?! – Page 02 – Giant Space Lizard! My walk goes quietly for the next fifteen minutes and I figure the old man has finally gone away. I would look back and check but then, if he’s still there, he’ll think that I care and it’ll only encourage him. It is then that I hear that familiar, shrill tone. 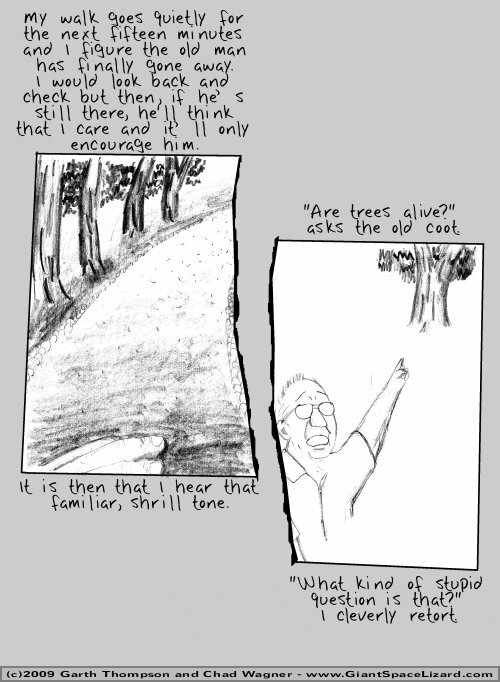 “Are trees alive?” asks the old coot. “What kind of stupid question is that?” I cleverly retort. Author adminPosted on 2009-07-25 2016-03-26 Categories When Will The Questions Stop? !